Mountain Ridges, Annapurna Circuit, Nepal. 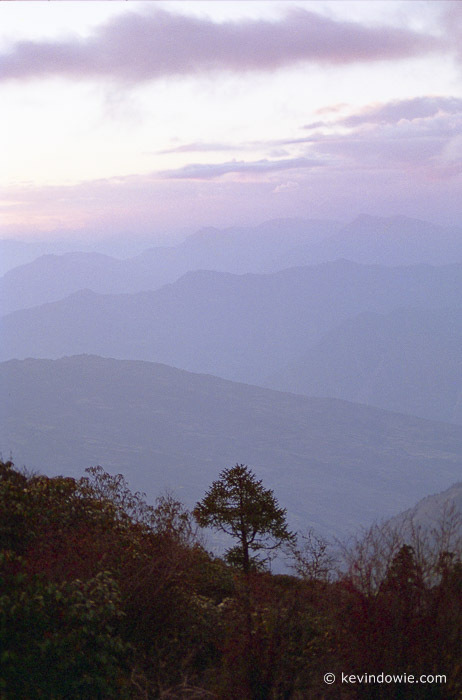 This image was taken late afternoon whilst trekking in the Annapurna region of Nepal in November, 1995, using a Pentax SF7 35 mm SLR with a 28-80mm zoom lens and Kodak ISO 100 colour negative film. Exposure details were not recorded, but I believe the lens was close to the mid point of it's zoom range, so about 50mm, at about F11 at 1/30 second. The negative was scanned using the Epson V700 flatbed scanner and Epsonscan software and is presented here full frame with minimal digital enhancement (see below for update). As discussed in a previous article, in falling light at the end of the day, you can find yourself using fairly slow shutter speeds making the use of a sturdy camera support such as a tripod worthwhile, some would say essential. In addition to camera shake the other consideration in a shot such as this is depth of field (DOF). The smaller the aperture the greater the depth of field, but of course with resulting longer shutter speed, so it's a trade off. This shot being taken on film, I was a bit restricted, however, these days with digital I'd have no hesitation in bumping the ISO rating up to 800 or higher so as to allow a suitable aperture for good DOF with a higher shutter speed. I often hear, and read, references to "landscape format" or "portrait format". I regard these terms as nonsense, they are horizontal or vertical format. Looking back over the images I've taken over the years, about 1/3rd of all my landscapes would be in vertical, or so called "portrait" format. This is particularly true when using wider lenses where the inherent extended DOF invites the inclusion of interesting foreground elements into a composition. I like this particular image for several reasons, the single shrub on the nearest ridge with the foreground almost, but not quite, in complete shadow and the repeating lines of the mountain ridges receding into the distance. The time of day and the cloud cover combine to give a soft light and what I find a pleasing colour to the sky and distant ridges.